The Accounts and performance section is presented in a manner that attempts to make the information provided understandable and relevant to readers. This includes providing relevant rather than generic information. The notes have been divided into eight sections: Basis of reporting, Net operating profit after tax, Invested capital, Net working capital, Capital structure and financing, Other financial notes, Environmental data and Social and governance data. The purpose is to provide a clearer understanding of what drives performance. The notes have been structured to provide an enhanced understanding of each accounting area, by describing relevant accounting policies and sources of estimation uncertainty in the notes to which they relate. Novozymes explains the accounting choices that have been made within the framework of the prevailing International Financial Reporting Standards (IFRS) and has elected not to repeat the actual text of the standard, unless this is considered particularly important for an understanding of the note content. The descriptions of accounting policies in the notes form part of the overall description of accounting policies. The notes for environmental and social and governance data also disclose Novozymes' management approach to the reported issue. The symbols I/S, B/S and ESG show which amounts in the notes can be found in the income statement, balance sheet, and environmental data and social and governance data respectively. The consolidated financial statements of the Novozymes Group have been prepared in accordance with IFRS as adopted by the EU and further requirements in the Danish Financial Statements Act. Novozymes has prepared the consolidated financial statements in accordance with all the IFRS standards effective at December 31, 2017. The fiscal year for the Group is January 1 – December 31. The consolidated financial statements have been prepared on a going concern basis and under the historical cost convention, with the exception of derivatives and securities, which are measured at fair value. The accounting policies are unchanged from last year. The principles are unchanged from last year. The adoption of the amended standards and interpretations has not had any impact on recognition or measurement in the consolidated financial statements for 2017 and is not anticipated to have an impact on future periods. IFRS 9 – Financial Instruments: Classification and Measurement of Financial Assets and Financial Liabilities was published in July 2014 and contains requirements for the classification and measurement of financial assets and financial liabilities, impairment methodology and general hedge accounting. We have completed an analysis to assess the impact of implementing IFRS 9. Based on the current treasury policy for hedging of risks, the implementation of IFRS 9 will not have an impact on the consolidated financial statements. The simplified expected loss model will be applied to trade receivables, but will not significantly impact the allowance for doubtful trade receivables. However, the implementation of IFRS 9 will impact disclosures on the allowance for doubtful trade receivables. The standard will be implemented using January, 2018 as the date of initial application. We will make use of the relief from restating comparative figures and will only apply IFRS 9 as of January, 2018. IFRS 15 – Revenue from Contracts with Customers was published in May 2014 and establishes a single comprehensive framework for revenue recognition. The standard is effective for annual periods beginning on or after January 1, 2018. During 2017, an analysis has been made of the impact of implementing IFRS 15. The analysis covered the most significant contracts, standard contracts and contracts where the analysis indicated that the implementation of IFRS 15 may impact revenue recognition. The analysis concludes that the implementation of IFRS 15 will not have a significant impact on the income statement or the related key ratios in the consolidated financial statements. However, items currently recognized in the balance sheet will be presented separately as contract assets and contract liabilities, and the disclosures on revenue will be impacted. The standard will be implemented using the modified retrospective method. Novozymes will make use of the relief from restating comparative figures and will only apply IFRS 15 to contracts that are not completed as of January 1, 2018. IFRS 16 – Leases was published in January 2016 and introduces a single lessee accounting model, requiring lessees to recognize leases in the balance sheet as a right-of-use asset and a lease liability, unless the lease term is 12 months or less or the underlying asset has a low value. In the income statement, the lease cost is replaced by depreciation of the leased asset and an interest expense for the financial liability. We have started analyzing the Group's current contracts containing a lease to assess the impact of implementing IFRS 16. However, the full impact is not yet known. Based on the ongoing analysis, the new standard is expected to result in an increase in total assets of approx. 3-5%. Consequently, the related key ratios in the consolidated financial statements, such as EBITDA Earnings before interest, tax, depreciation and amortization. and ROIC Adjusted operating profit (NOPAT) after tax as a percentage of average invested capital. EBIT is adjusted for net foreign exchange gains/ losses and share of result in associates., will be impacted. The right-of-use asset and lease liability are to be presented separately in the balance sheet or disclosed in the notes. Furthermore, the implementation of IFRS 16 will impact disclosures. Novozymes' annual report is based on the concept of materialityThe materiality assessment process identifies key topics that pose both risks and opportunities for Novozymes’ business strategy. It is based on a systematic analysis of internal and external stakeholder perspectives. Material topics merit inclusion in our report, as they reflect our economic, environmental and social impacts or because they might influence stakeholder decisions., to ensure that the content is material and relevant to the readers. The consolidated financial statements consist of a large number of transactions. These transactions are aggregated into classes according to their nature or function, and presented in classes of similar items in the financial statements and in the notes as required by IFRS. If items are individually immaterial, they are aggregated with other items of a similar nature in the statements or in the notes. The disclosure requirements throughout IFRS are substantial, and Novozymes provides the specific disclosures required by IFRS unless the information is considered immaterial to the economic decision-making of the readers of these financial statements. The consolidated environmental and social and governance (ESG) data include the parameters that, based on an assessment of materiality for Novozymes and its stakeholders, are deemed the most relevant. Novozymes’ materiality assessment is a systematic and rigorous process that integrates inputs from external stakeholders, trend analyses and internal engagement with relevant departments, for example senior leadership from Novozymes' business divisions, Investor Relations, Risk Management & Controls, Public Affairs and Corporate Sustainability. The process results in two outputs: 1) disclosures on key trends, which can be found in the section on Novozymes’ business model, and 2) disclosures on material ESG issues, which can be found in the Notes sections. The illustration is a snapshot of the upper-right quadrant of Novozymes’ materiality matrix and depicts 15 ESG issues that are most material to Novozymes’ business. The materiality matrix includes some new issues and other changes compared with the previous year. 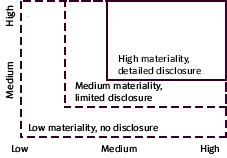 For further details on the materiality assessment process and an explanation of all the changes in the matrix compared with 2016, see Materiality in detail in the Sustainability section. Solid capital structure refers to Novozymes' ability to finance its overall operations and growth using different sources of funds. Profitable growth refers to organic sales growth that increases the company's operating profit. Climate change & energy refers to Novozymes' commitment to climate action and its activities to address climate change risks and opportunities, reduce GHG emissions, invest in energy efficiency ans support the production and uptake of renewable energy. Water is a key natural resource for Novozymes and needs to be managed locally in all operating regions. Water scarcity has become a global challange, and innovative activities are needed to optimize water consumption, reduce wastewater discharge and increase water recycling and reuse opportunities. Bioethics & biodiversity describes how Novozymes supports the adoption of ethical, science-based regulation for processes and products involving gene technology. It also includes our responsibilities with regard to biodiversity rights, sharing benefits and engaging stakeholders on the role of bioinnovation for society. Product stewardship is the practice of designing and managing products to minimize adverse environmental, health and safety impacts across the product life cycle. Occupational health & safety describes all of Novozymes' policies and initiatives to ensure a safe, incident-free and healthy work environment. Labor practices & human rights refers to the system of policies and processes to promote equal rights, diversity and talent development for all employees, and to ensure decent working conditions and respect for human rights across the value chain. Community engagement & social investment refers to Novozymes' initiatives to engage with the communities in which it operates and invest in programs that create value for society. Corporate governance describes the system of policies and processes that determine how Novozymes is directed and overseen by its Executive Leadership Team and Board of Directors. Business ethics refers to Novozymes' commitment to doing business in a responsible way, which is essential to attract and retain investors, employees and customers. It includes all measures to work against corruption, anticompetitive practices, fraud and unethical policy advocacy. Compliance refers to Novozymes' commitment to comply with relevant financial, governance, environmental and social regulations in all operating regions. Responsible sourcing is the practice of considering social and environmental aspects, in addition to quality and economic aspects, when managing relationships with suppliers to promote sustainable supply chains. Innovation refers to the process of developing novel products and optimizing processes to meet global challenges. Partnerships & customer engagement refers to Novozymes' focus on building partnerships with stakeholders from the private sector, governments, civil society, etc. for business growth and sustainable impact. It also includes specific processes to retain existing customers and engage new customers. The environmental data cover those activities that could have a significant impact on the environment. Sites with activities considered not to have a significant environmental impact are not included. Such sites comprise sales offices, R&D labs, and sites with limited blending and storage of products. However, measures are taken to ensure that at least 97% of the total Novozymes quantity of the measured environmental parameter is included in the reported numbers. The preparation of the consolidated financial statements in conformity with IFRS requires Management to make estimates and assumptions that can have a significant effect on the application of policies and reported amounts of assets, liabilities, income, expenses and related disclosures. The estimates and underlying assumptions are based on historical experience and various other factors. Actual results may differ from these estimates. The estimates and underlying assumptions are reviewed on an ongoing basis. Changes in estimates may be necessary if there are changes in the circumstances on which the estimate was based, or as a result of new information or more experience. Such changes are recognized in the period in which the estimate is revised. The application of the Group’s accounting policies may require Management to make judgments that can have a significant effect on the amounts recognized in the consolidated financial statements. Management judgment is required in particular when assessing the substance of transactions that have a complicated structure or legal form. The descriptions of accounting policies in the notes form part of the overall description of accounting policies. The consolidated financial statements comprise the financial statements of Novozymes A/S (the parent company) and subsidiaries controlled by Novozymes A/S, prepared in accordance with Group accounting policies. The consolidated financial statements are prepared by combining items of a uniform nature and subsequently eliminating intercompany transactions, internal stockholdings and balances, and unrealized intercompany profits and losses. Environmental and social data are similarly based on data for the parent company and subsidiaries by combining items of a uniform nature compiled using the same accounting principles. Recognition of newly acquired or divested sites and subsidiaries follows the same principles as for the financial reporting. The consolidated financial statements are presented in Danish kroner (DKK). Foreign currency transactions are translated into the functional currency defined for each company using the exchange rates prevailing at the transaction date. Monetary items denominated in foreign currencies are translated into the functional currency at the exchange rates prevailing at the reporting date. Financial statements of foreign subsidiaries are translated into Danish kroner at the exchange rates prevailing at the reporting date for assets and liabilities, and at average exchange rates for income statement items. Goodwill arising on the acquisition of new companies is treated as an asset belonging to the new foreign subsidiaries and translated into Danish kroner at the exchange rates prevailing at the reporting date. Unrealized gains/losses relating to hedging of future cash flows and hedging of net investments in foreign subsidiaries are recognized in Other comprehensive income.